F25 installed just fine alongside Windows 10. I'm now doing the same thing with F26 but it hangs on the message seen in the attached image. Anyone else experiencing this? This issue is for first time installation of F26....I have never got as far as the GUI setup wizard. As I say it hangs as per the attached image. Do I have any options for setup that I could change? @handsy your issue seems to me being related to the video driver. I've asked you if you can get to logging in into text mode either switching to a virtual terminal with ctrl-F2 or booting directly to "runlevel" 3 as explained in my previous comment. 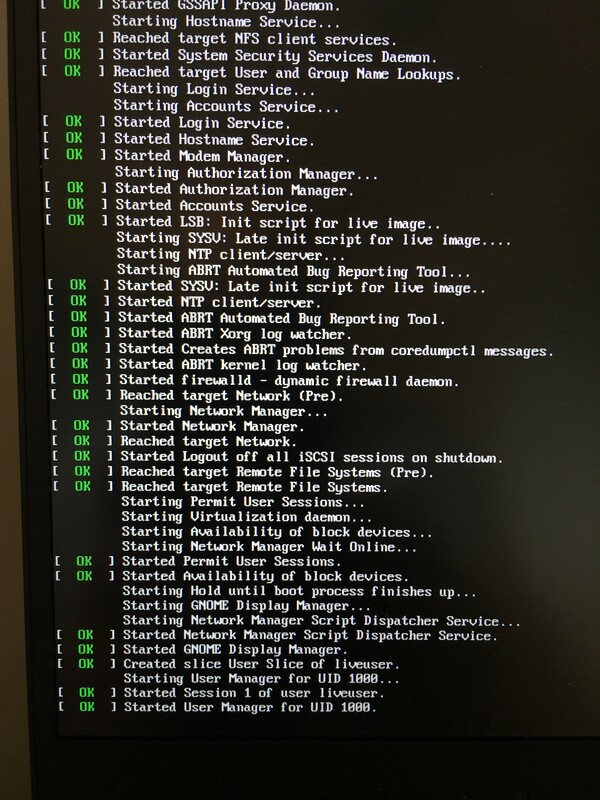 @handsy move the cursor to the line starting with linuxefi and append 3 at the end, just after quiet. After that hit ctrl-x. Select troubleshooting from the initial grub screen and then start in basic graphics mode. Also, once installed, go to dconf editor and change the scaling to 2. Org.gnome.desktop.interface.scaling factor custom value=2. Also, set the Window scaling under HiDPI in the tweak tool to 2. Reboot and Bob's your uncle.